Unlike their baseball counterparts in Cooperstown, the Pro Football Hall of Fame in Canton, Ohio seems to surprise collectors every year with the induction of a player or two that flies under the radar. As a result, many collectors are often tasked with researching players they hadn’t necessarily pegged for inclusion. While some selections are obvious, every year brings a new slate of players for collectors to add to their Hall of Fame collections. Below is a primer on the rookie cards and some of the other collectibles for the 2012 Pro Football Hall of Fame inductees. Jack Butler played 103 total games between 1951 and 1959. He was a four-time Pro Bowler who amassed 52 interceptions with 827 return yards and four pick sixes. 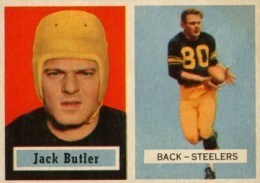 Butler was named to the 1950’s NFL All-Decade Team. Butler has few other collectibles other than in-person and through-the-mail (TTM) autographs. 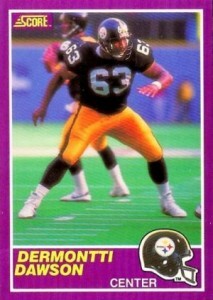 Dermontti Dawson appeared in 184 total games between 1988 and 2000. Drafted in the second round of the 1988 NFL Draft, he was 44th overall pick. Dawson was named to seven consecutive Pro-Bowls between 1993 and 1999 and was twice named Offensive Lineman of the Year. 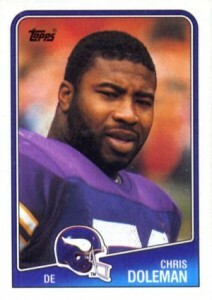 Selected fourth overall in the 1985 NFL Draft, Chris Doleman played in 232 total games from 1985-1999. 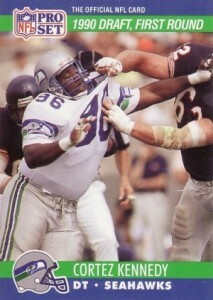 Over those 15 seasons, he played in eight Pro Bowls and was named the league's co-Defensive Player of the Year in 1992. So far, Doleman has certified autographs in two sets, including ten different cards in 1992 Pro Line Portraits. He also has an autograph in 1993 Pro Line Live that is serial numbered to 1000. To date, Doleman has no game-used cards. An eight-time Pro Bowl selection, Cortez Kennedy shared 1992 Defensive Player of the Year honors with fellow inductee, Chris Doleman. Kennedy played in 167 total games over 11 seasons from 1990-2000. He was the third pick in the 1990 NFL Draft. Kennedy has certified autographs in 1991 Pro Line Portraits and 1995 Pro Line (#/1380). He also has two memorabilia cards to-date, including 2000 Bowman Reserve Pro Bowl Jersey #PBCK and 2000 Pacific Omega #10. Other Notable Collectibles: Kennedy has several unique inserts made by the Pacific Trading Card Company in the late-90s. Curtis Martin joins Barry Sanders as one of only two NFL running backs to rush for 1,000 yards in ten straight seasons. The third round pick from the 1995 draft played for 11 seasons, racking up 14,101 career yards on 3,518 carries. Martin, a five-time Pro Bowl selection, also scored 90 career rushing touchdowns. 1995 Signature Rookies Signature Prime Autographs. Other Notable Collectibles: Martin has many autograph and memorabilia cards on the market with price ranges to meet any fan or collector’s budget. He also has several figures from the Starting Lineup and McFarlane SportsPicks lines. 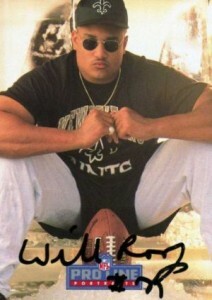 Willie Roaf appeared in 189 games between 1993 and 2005. The eighth pick in the 1993 draft, he appeared in 11 Pro Bowls and was named Offensive Lineman of the year in both 1993 and 1994. 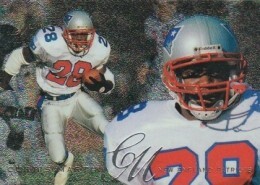 Roaf also has an autograph in 1993 Pro Line Portraits Autographs #24. Other Notable Collectibles: Roaf has few other collectibles other than in-person and TTM autographs. Curtis Martin Jets Signed Side View Running 8x10 Photo w HOF 12 Insc.